Mr. Redmon has practiced law in Northern Virginia since 1964, concentrating his practice in banking, commercial and real estate transactions, and estate and trust planning and administration. Prior to 1964, he was Associate Counsel for Atlantic Research Corporation, a defense research firm headquartered in Fairfax County, Virginia, which followed one year in the Office of the Solicitor of the United States Department of Labor. 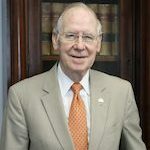 Mr. Redmon was general counsel of a national bank from 1966 through 1972 and, as such, performed all of the services required by the bank in dealing with real estate loans, as well as other loan transactions. He remains active in banking. For twelve years, he was general counsel in the Washington metropolitan area to a major residential real estate broker, for whom he handled general corporate matters, transactional issues, and real estate broker and agent malpractice claims. Currently, he is general counsel to a major real estate services conglomerate.